I’m positive your 4th of July plans include more than two people, however, hear me out: this recipe is easily scaled up to feed your crowd. Like, way too easily. And then suddenly you have hand pies for breakfast, which isn’t entirely a bad thing. I’m so dang happy right now because 1) I have a pie in my hand and 2) we will have a crowd this Wednesday night. Not only are my parents driving up for a quick visit (hooray for living close to family again! ), but the Mr. and I have met some pretty wonderful people in this new city already. I’ve always heard midWestern people were the nicest bunch around, and I’m happy to report it’s very true. We will be smiling from ear to ear while we cook it up for our crowd. He’s in the charge of the meats on the grill (including red chile buttermilk-marinated chicken! ), and I’m in charge of side dishes and dessert. 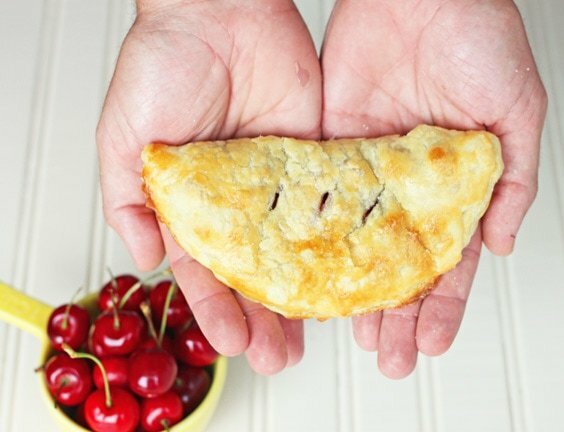 I plan on making these fresh cherry hand pies. Puff pastry makes this recipe easy peasy, and I bet you even have the other ingredients in your pantry already. I’m one of those people that always keeps puff pastry in my freezer (because you can even make puff pastry donuts with it! ), but just in case you don’t, I have a recipe for homemade puff pastry from scratch. And once you make your own puff pastry, you can also make ham and cheese puff pastry squares or apple turnovers. Did you know?! Puff pastry is amazing stuff. This recipe is a starting point for you. Simply multiply the ingredients by how many guests you have, and then bake! I hope y’all have a wonderful 4th of July! Dainty pies look best in rough farmer hands. Fact. 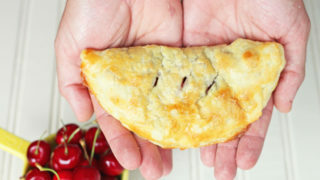 Fresh cherry mini hands pies: Recipe makes 2 hand pies, but can be doubled. First, pit and quarter your cherries. Place them in a bowl and add the brown sugar, extract, lemon juice and cornstarch. Stir to combine, then set aside. Flour the counter and unfold the pastry sheet, and then lightly roll it out pastry to be about 1/2" larger on all sides. Using a 6" round cutter, cut out 2 circles. Move the circles to a baking sheet lined with parchment paper. Divide the cherry filling evenly between the dough rounds, placing it on one side of the circle about 1/2" from the edge. Beat together the egg yolk and heavy cream in a small bowl, then brush the entire edge of the dough circles with it. Fold over the dough and crimp to seal the edges. Slice 3 slits in the top of each pie and sprinkle with sugar. Let cool for 10 minutes before serving (or hot cherry lava will erupt in your mouth upon the first bite). This recipe easily multiplies up to feed a crowd. Enjoy! These are just a wee bit better than the Hostess Cherry Pies I grew up with and loved every second of snacking on…you outdid yourself! 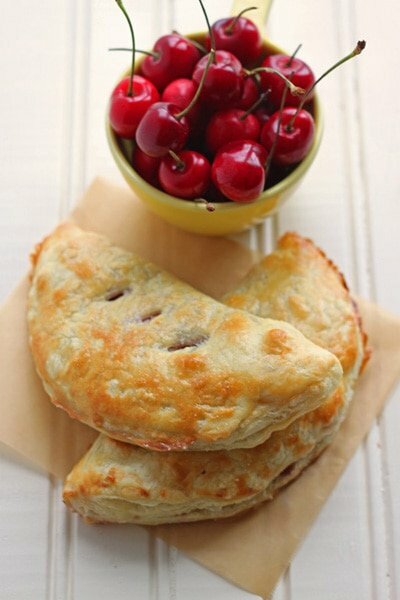 I’m not really a fan of cherry pies but these look wonderful! I’m glad y’all are enjoying Kansas and hooray for family visits! :) I hope you have a wonderful 4th of July! I looOoooove fresh cherry anything! Happy 4th July, I’m so glad you’re settling in well and I hope you have a wonderful day of fun! I love a good hand pie! This recipe is fabulous! Sounds like a great 4th! Love these cute little pies. I made strawberry hand pies the other day, and they turned into a complete mess! I love yours… so beautiful and delicious!! These look absolutely wonderful! It’s been entirely TOO long since I had a hand pie, and I’m definitely thinking about making some of these for tomorrow now. We’re sharing some recipes over at Delightfully Southern today that we think would go perfectly for the Fourth, and we hope you don’t mind that we’ll be highlighting this one because it just looks perfect! Your neighbours, no doubt, are counting their blessings to be close to YOU!! Happy 4th of July my love! Awww I love family time – and pies! Have a wonderful holiday! Love it in the rugged farmers hand… looks perfect :) and so do the pies! Lovely! I have a serious love for fresh cherry pie…yum! Oh, they look so buttery and flaky, yum! Hi….just made these …..what a mess…..the filling was oozing out….very liquidy…I could hardly crimp them…not pretty!…..what did I do wrong!….but tasted yummy. Did you use fresh cherries? Frozen cherries = nightmare! Did you allow the cut cherries to sit while you prepared the dough? The cornstarch thickens the cherries while it sits. I purposefully used an extremeley high rate of cornstarch in this recipe to prevent cherry ooze. If anything, the final product should be on the dry side rather than wet. You said you had a hard time crimping: was your dough cold? If your dough was warm or room temp, I can imagine it would be hard to handle. YUM! Totally love cherry – I think I look at your cherry fool post at least once a day :) And i think this is post will be a silmiar thing for me :) Love the rugged hands! I’ll take about 20, please. Perfect! Awesome use for puff pastry! I’ve never used puff pastry before, so this looks clever and fun to me. Love the fresh cherries and the gorgeous dessert. Hope you had a fun 4th! I would have to double recipe by 4 and still eat them all myself!! pretty,pretty pies! I am all for pies that you don’t need a fork for!! These look great! Can you tell me how you crimp these? With a fork or just your fingers? Thanks! These look very scrumptious! I love puff pastry… but I cannot eat it too much because it is really fattening!! Sometime for a treat I will have to try these!!! Yum! this is AWESOME!!! yummy. I can’t wait to try this! Pinned! so healthy! Thank you for small recipes. I live alone and two is perfect. 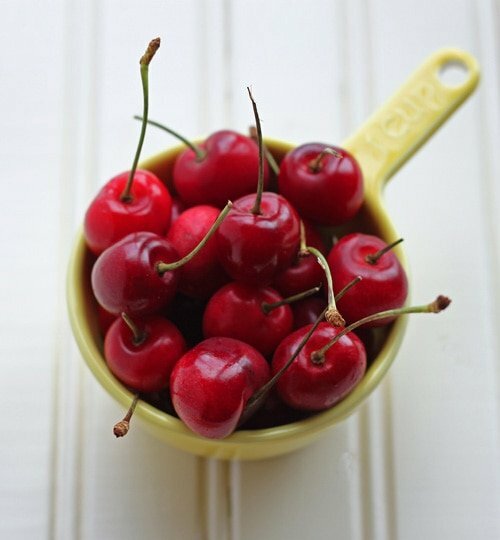 Did you use sweet cherries, or sour pie cherries? About how much does 5oz of cherries end up measuring once pitted and quartered? (I don’t have a scale). Half cup? Cup?